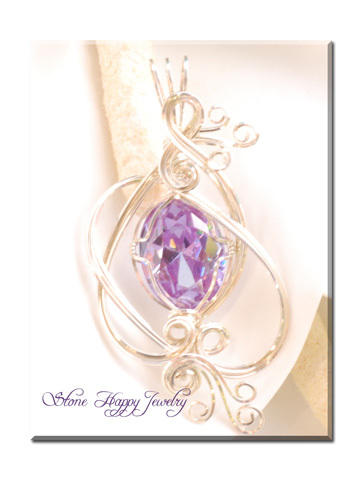 The soft shade of lavender in a cubic zirconia oval. Set in sterling silver wire and ready to sparkle on your lovely neck. It measures 2 3/4 inches (7 cm) by 1 1/2 inches (3.7 cm) so it can be seen and enjoyed. 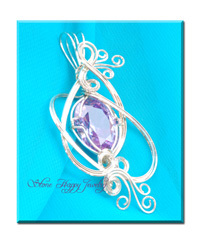 It is not heavy or cumbersome, but looks light and airy and feminine with the open swirls. 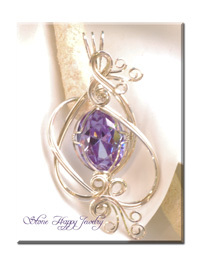 Included is a matching purple leather necklace with a sterling silver lobster clasp at 16 inches.